Continuing my recommendations from the Great Movies – 100 Years of Film book for my screening of Snow White, I happily dove into this canine tale, which, much like the other recommendations so far, I hadn’t seen in years. Set in London, with a fantastic score by George Bruns, and based on the book by Dodie Smith, with wonderful backgrounds that look like they were illustrations lifted right from the original tale, Disney brings to life the adventures of Dalmatians, Pongo (Rod Taylor) and Perdita (Cate Bauer). Pongo, and his pet, musically inclined Roger (Ben Wright), are single bachelors, something Pongo wants fixed. He plays matchmaker, and Anita (Lisa Davis), Roger, Perdita and himself settle in together, and it’s not long after when Perdy becomes pregnant. 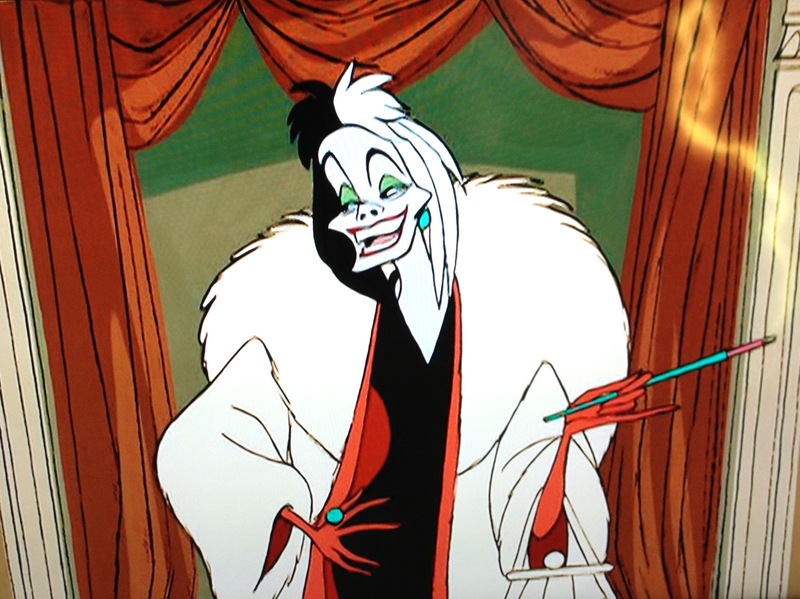 Cue entrance of yet another iconic Disney villain, the cadaverous, dastardly, fur-loving fashionista, Cruella De Vill (Betty Lou Gerson) – who has her own theme song! and is one of only two songs in the entire film. Cruella has her eyes set on Perdita’s puppies, as well as those of other Dalmatians being born, as she thinks a spotted dog fur coat would be just about perfect. 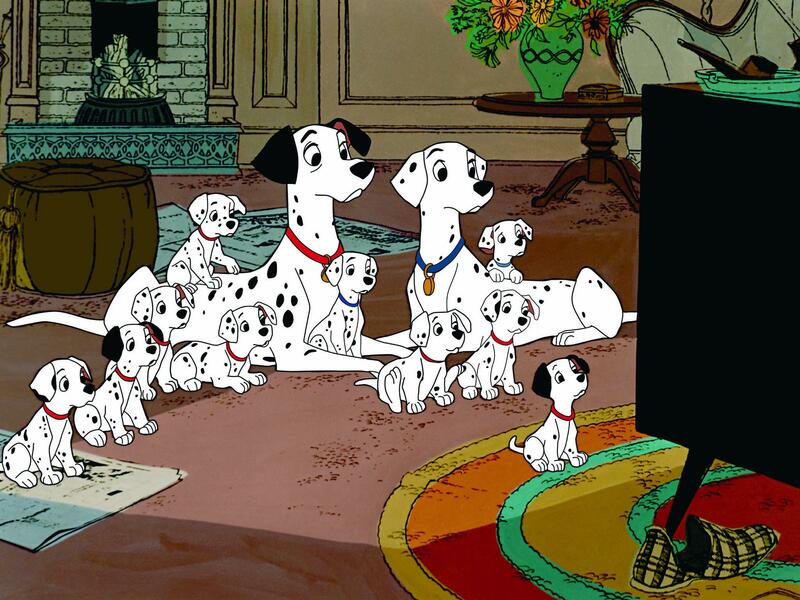 When Roger denies Cruella the litter of 15 puppies, who overrun the home in quick order, she gets her two thugs, Horace (Frederick Worlock) and Jasper (J. Pat O’Malley) to steal them, and add them to 84 dalmatian puppies they have actually bought and paid for. Desperate to find their children Pongo and Perdy turn to the twilight bark (watch for a couple of familiar faces from Lady and the Tramp), a canine chain of communication until the puppies are found in a remote mansion. Aided by the Colonel (O’Malley) and Tibbs (David Frankham), the puppies are rescued, but then they have to find their way back to London avoiding Cruella, her monstrous car, and her cronies. What I discovered re-watching this, is that it has a solid story, great voice talent, and some wonderful moments that despite being aimed at families, never talks down to its viewers. There are terrible things talked about in this film, the idea of skinning those poor puppies and turning them into coats no doubt haunted a lot of children, but the film doesn’t shy away from it, in fact, that is what makes the stakes so high. This is literally life and death, and a struggle to keep a family together. Still, it’s a lot of fun, was a delightful re-watch and just gets me excited for the next one, which is one of my favorite classic animated Disney films!